George Saunders. New York: Riverhead Books, 1996. 179pp. George Saunders. New York: Riverhead Books, 2000. 188pp. 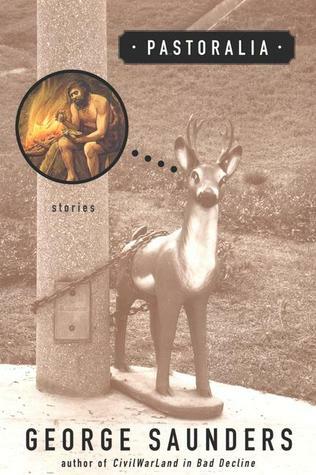 George Saunders is one of those writers of whom it is said, “Even if his name wasn’t on the book, I’d know he wrote it.” Since his first stories began appearing in the early 1990s, he has been giving us ever more interesting and distinctive glimpses of a surreal world which is not quite our own, but very frighteningly close — a world of people who regret their lives but still manage to find optimism, a world where free market economic principles dominate every aspect of life, a world where everyone’s language is suffused with corporate doublespeak and self-help homilies. And, more than anything else, a world of amusement parks which don’t quite work the way they’re supposed to. Today my possible Historical Reconstruction Associate is Mr. Haberstrom, founder of Burn ‘n’ Learn. Burn ‘n’ Learn is national. Their gimmick is a fully stocked library on the premises and as you tan you call out the names of any book you want to these high-school girls on roller skates. As we walk up the trail he’s wearing a sweatsuit and smoking a cigar and I tell him I admire his acumen. I tell him some men are dreamers and others are doers. He asks which am I and I say let’s face it, I’m basically the guy who leads the dreamers up the trail to view the Canal Segment. He likes that. He says I have a good head on my shoulders. ... Not to be crass but I sense an impending sizable contribution (3-4). Saunders is also, as can be seen from the passage above, a master of pacing. The effectiveness of the voice within his writings comes as much from the rhythm of the sentences as it does from what the sentences actually say. It is hard to tell whether these stories are satires, comedies, pathetic tragedies, whimsical excursions into grotesque absurdity, or some other not-quite-right label, because just when you think you’ve got a handle on what Saunders is up to, he shifts masterfully into another mode. Predictable these stories are not, and much of their odd power comes from surprising language and events which feel, more often than not, exactly right. “You sold the rehab TV to buy drugs,” she says. “To buy substances, Ma, why can’t you get it right?” he says. “The way we name things is important, Ma, Doe taught me that in counseling. Look, maybe you wouldn’t have sold the TV, but you’re not an inadvertent substance misuser, and guess what, I am, that’s why I was in there. Do you hear me? I know you wish you had a perfect son, but you don’t, you have an inadvertent substance misuser who sometimes makes bad judgments, like borrowing and selling a TV to buy substances” (30). The way we name things is important — those words are a key to many of the problems Saunders’s characters encounter. The names for things have become so vague and unwieldy that the English language itself has lost its ability to refer to anything specifically. Many names have been compounded and suffered a Madison Avenue adspeak makeover: CivilWarLand, MegaDeathDealer, HardwareNiche, GuiltMasters, GlamorDivans, ToyTowne, FunTimeZone, PuppetPlayers. Other names are typical doublespeak, such as the term “Staff Remixing”, used by the administrators of the park in “Pastoralia” to describe what they are doing by firing many of their employees. “Now, if someone came up and crapped in your nice warm oatmeal, what would you say? Would you say, ‘Wow, super, thanks, please continue crapping in my oatmeal’? Am I being silly? I’m being a little silly. But guess what, in real life people come up and crap in your oatmeal all the time — friends, co-workers, loved ones, even your kids, especially your kids! — and that’s exactly what you do. You say, ‘Thanks so much!’ You say, ‘Crap away!’ You say, and here my metaphor breaks down a bit, ‘Is there some way I can help you crap in my oatmeal?’” (72). The man listening to this lecture, Neil Yaniky, is then encouraged to identify exactly who is crapping in his oatmeal. And he identifies his mentally handicapped sister, who lives with him. He decides that he is going to tell her she can’t live with him anymore. Then, in a magnificent move, Saunders changes the viewpoint — suddenly, we are in Winky’s mind as she waits, with great excitement, for her adored brother Neil to come home. Previously, we had been at least partially sympathetic to Neil’s plight, and the advice he was getting seemed perhaps useful, if a bit overwrought. But now the situation is much more complicated. Winky is a fascinating character and we care about her. After being in her mind for a bit, Saunders brings us back to Neil as he opens the front door of his house and Winky greets him with a very enthusiastic “Welcome home!”. The last paragraph of the story, a story which has been laugh-out-loud funny so far, is devastingly sad. The stories in Pastoralia have more emotional depth than those in CivilWarLand, for in the time between the two books, Saunders discovered ways of filling his absurd and sometimes grotesque plots and characters with emotional complexity, ambiguity, and paradox. Human beings are complicated, and what we want at one moment may not be what we want at the next, and the later stories demonstrate this with great skill. 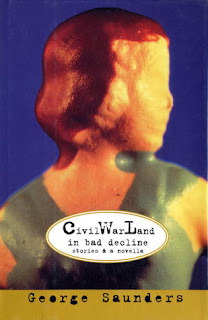 However, there is an anarchic beauty to the best stories in CivilWarLand, which contains tales such as “The Wavemaker Falters” and “Downtrodden Mary’s Failed Campaign of Terror” which are masterpieces of the bizarre. They don’t pack the emotional punch of the later stories, but they are gems of a different sort — off-kilter visions of evil banality and good intentions leading to chaos. While some of Saunders’s stories are certainly stronger and more affecting than others, with one exception they are all, it seems to me, rewarding to read. The exception is the 91-page novella at the end of CivilWarLand in Bad Decline, “Bounty”, a post-apocalyptic story filled with interesting moments but so badly structured that it seemed to me, after about ten pages, tedious and, ultimately, forgettable. “Tedious” and “forgettable” are not words I would use for any of Saunders’s other stories. I first encountered George Saunders when “Pastoralia” was published in The New Yorker, and after reading it I searched through back-issues of that magazine and others, desperate to read everything else he had written. I have since reread all of his stories in the order he put them in his collections, and I highly recommend this approach, for you will begin with the good fun of the title story to CivilWarLand in Bad Decline and end with “The Falls”, a story in which Saunders uses the same multiple point-of-view technique he employs in “Winky” to even greater effect, showing how the grand impossible dreams of a couple of misfits are ultimately less important than a single moment of instinctual, and perhaps futile, heroism. “The Falls”, it seems to me, brings Saunders’s characters full-circle in the vivid and tragicomic world common to the two books, and I look forward to seeing how he extends and broadens his vision in the future, for there are few writers whose next work I so deeply long to read.